Daikon literally means ‘big root’. This long white crunchy vegetable looks like horseradish, but it’s mild-flavored, similar to watercress. Daikon is also known as winter radish, oriental radish or Japanese radish. Chef Devaux explains how it’s great material to turn into a beautiful rose. Cut off a piece of 7.5 cm (3 inch). Peel the skin off by dragging the knife across the surface. Take a carving knife to make trace cuts, dividing the top of the daikon into 5 even segments. Extend the trace cuts to the sides of the daikon. Cut a small notch in between two trace cuts. From the notch, make a smooth curved trace cut towards the existing trace cuts on both sides. These curved trace cuts are the traces for the rose petals. Make another small notch in between the next two trace cuts and repeat the process. This way you’ll end up with trace cuts for 5 equal petals. Take a good look at the video to see where exactly you need to make all these cuts. The next step is cutting off a V-shape for each petal. Start from the notches you already made. Cut until you reach the trace cuts on both sides. Repeat from each notch. You’ll end up with 5 basic petals. Now give each petal some definition. Place the knife at the petal tip and cut off a thin, curved slice all the way to the bottom. Do the same with each petal. Again, watch the video to see how to do make these cuts. The petals are way too thick, so the next step is removing some of the flesh to create thin petals. From the tip of each petal, make the petals 2 millimeters thin by cutting downwards to the joining part of two petals. Be careful while doing this. 2 millimeters is quite thin and will make the petal fragile but more realistic. Cut out the flesh by making another cut at a 45-degree angle. Repeat with each petal. Be careful not to make the cuts too deep, otherwise you’ll damage or even cut off the petal. Again, watch the video for clarification. Put the daikon rose in progress on its side and cut off a small part of the top in the middle. Cut off the corners from the center part to give it a round shape. Now cut out thin pieces of flesh to create inner petals. Work your way around the center from the outside to the inside. The more you reach the center, the less room you have, so the pieces you’re cutting out become smaller and smaller. Need we say it one more time? Watch the vide for clarification. Lay the daikon on its side and cut out thin strips between the petals. To do this, follow the trace cuts and make them more pronounced by making them slightly deeper, cutting from 45-degrees angles on both sides of each trace cut. 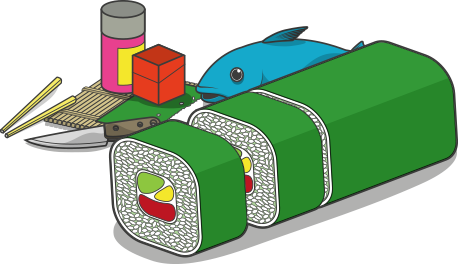 Now give the bottom end of the daikon a round shape by cutting off a thin strip at a 45-degrees angle, all around the bottom. Scrape off some extra flesh to optimize the round shape. For the next step, you’re going to need beetroot juice. Take a few beetroots, cut off the greens and wash the roots thoroughly. Then put them in a juicer. If you don’t have a juicer, use a blender and press the pulp through a fines mesh strainer. Dip a small paintbrush in the beetroot juice and start painting the flower. Start from the top edges, but don’t paint everything. The lower parts of the flower should remain white, at the inside and at the outside. When you’re finished panting, rinse the flower to get rid of excess paint and lighten the red color. As a last step, paint the top edges of the flower. This adds contrast, giving the flower a more realistic appearance. For presentation, make a bed of some parsley. Put the rose on top. Done! 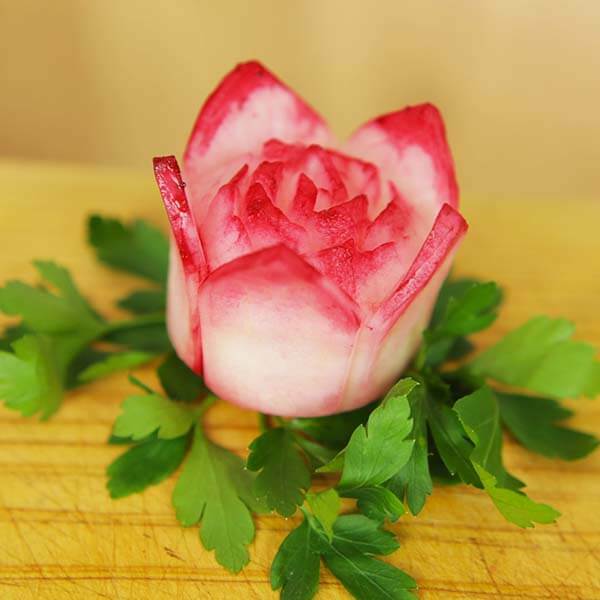 You just created a beautiful daikon rose, and it’s still good for eating!